Since switching to large format, I’ve learned that planning and preparation are the key to success. Sure there have been times when I just happened to have my 8×10 camera & film in my truck — and I just happened to see something interesting to shoot, but that isn’t usually the case. The vast majority of my photos are what I call project shots. These are shots that I’ve had in my mind for quite some time. I know what I want to capture, it’s just a matter of waiting for the right conditions. 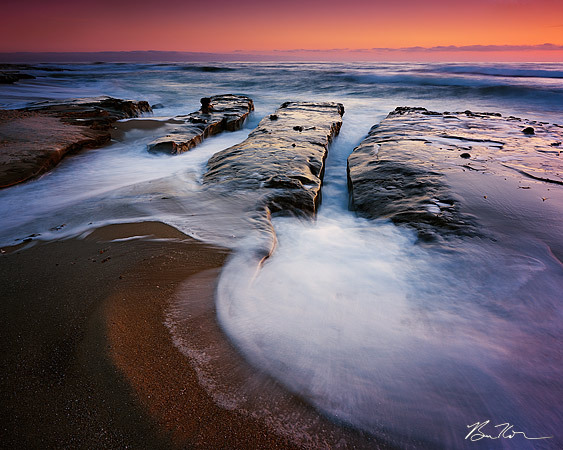 For example, this photo from La Jolla was one of my first project shots. I wanted to capture this rock formation for quite some time, and it took half a dozen trips to the beach before the conditions were right. On a side note, I always have a hard time displaying this one on the web because the colors go a bit funky (Thanks sRGB! ), but I can assure you that the print is sweeeeeeeeet! I have another project shot 100 yards south of this location. I’ve been there many times, but I have yet to truly capture the photo I have in mind. The importance of a project shot is that it gives me a goal — something to pursue. Without the guidance of these personal quests, I am adrift on a photographic journey with no real sense of direction. You might remember a project shot I first mentioned nearly a year ago. It is best illustrated by this snapshot from a Canon G12. My goal is to capture a vertical shot of this peak with a singular, massive, thunder head looming over it. The triangular form of the mountain, combined with a menacing cloud, would make for a very graphic and interesting shot. In the month of August, monsoonal moisture spills into southern California. When combined with warm weather, this produces thunder storms over the local mountains. This year, mother nature was a bit behind. It wasn’t until late August that we began to see this pattern. I’ve spent the last two weekends hiking to my location, and watching for just the right clouds. When I began the 3 mile up-hill hike last weekend, the sky was promising. It was 95 degrees, and the air was thick with humidity. When the mountain came into view, I saw a towering thunderhead in just the right position. I was too late. This monsoonal pattern extends into the month of September, so I will have more opportunities to get my shot. Otherwise, there is always next August. This entry was posted on September 1, 2011 at 8:11 pm and is filed under 8x10, Photography, Shooting Tips. You can follow any responses to this entry through the RSS 2.0 feed. You can leave a response, or trackback from your own site. Going back again and again is half the fun. The best part is that when the conditions are right — you know you have the best possible photo from that location, and can check it off your list. 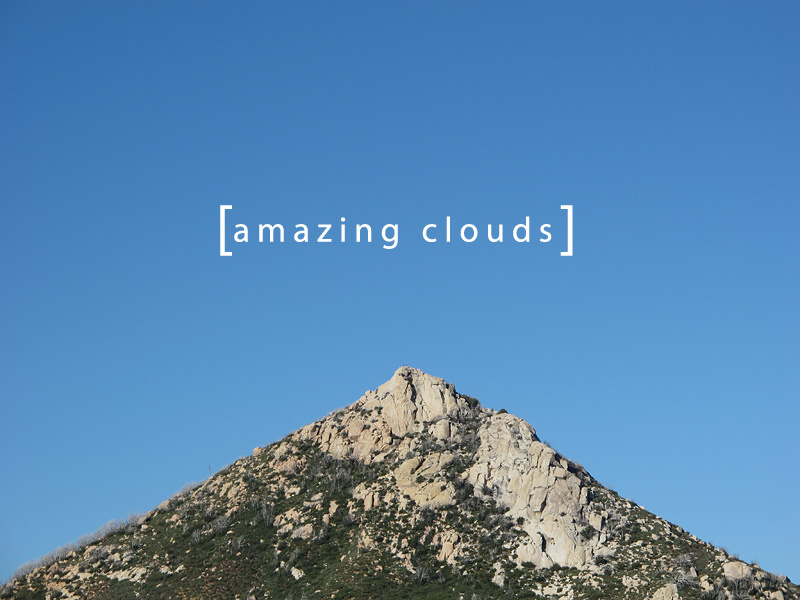 The “[amazing clouds]” photograph has a bit of John Baldessari in it. I like it. I had to google Baldessari to learn about him. You’re right, it does seem like something he would do!